Obituary for Terry Barron | Wellman Funeral Homes, Inc.
Terry L. Barron, 59, passed away peacefully in his home on Wednesday August 29th, 2018. Surrounded by his family, following a courageous battle with cancer. He was born to the late Orville and Eva Barron on March 19, 1959. A man dedicated to his family, he is survived by his best friend and wife of 38 years, Bobbie (Hubbell) Barron, son Jeremy (Lindsay) Barron of Churubusco, Indiana, daughter Brooke (Eric) Gerst of Zanesville and grandchildren Emily, Lane, Logan, Lawson and Kyson. In addition to his parents, Terry was preceded in death by his Father-in Law, Alan Hubbell. Terry will be missed by many; his sister, Connie (Jake) Coleman of McArthur, brother Bill (Debbie) Barron of New Matamoras, twin sister Jeri (Craig Webb) Barron of Sherman Oaks, California, mother-in-law, Jane Hubbell and sisters in law Becky (Steve) Huston and Shadra (Kevin) Jenkins, as well as several special nieces, nephews, cousins and good friends. 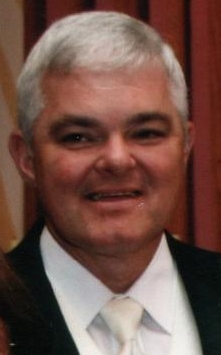 Terry was a devoted husband, loving father and proud papaw, he dedicated his life to serving others. Upon graduating from Vinton County High School in 1977 he entered the Sheet Metal trade where retired from Sheet Metal Workers Local 24. He never knew a stranger and he loved to talk. Terry graduated from the Missouri Auction School and was an Auctioneer for over 30 years. He lived his values and was known for work ethic. Along with wife Bobbie they built Barron Auction and Real Estate where they worked together for over 20 years. A lifelong farmer Terry and Bobbie raised cattle and hay in Ross and Vinton Counties. A dedicated public servant he served his community through the Colerain Twp. Volunteer Fire Department followed by 16 years as a Colerain Twp. Trustee. Terry was a hard worker and always willing to lend a helping hand. Although his life was cut short by cancer, Terry had a life well-lived. Services will be at Wellman Funeral Home in Laurelville on Sunday September 2, 2018 at 2:00 p.m. They will be conducted by Brian Davis, Pastor of Adelphi UMC where Terry was a member. Burial will follow in Green Summit Cemetery. Following services, a celebration of life will be held at the Colerain Twp. Fire Dept. Annex in Hallsville. Friends may call on Saturday from 4 to 8 p.m. at the funeral home. In lieu of flowers, donations may be made to the Joan Bisesi Fund for head and neck cancer at the James Cancer Center, https://www.giveto.osu.edu/makeagift or the Adelphi United Methodist Church, 11879 Main St, Adelphi, OH 43101. Online condolences can be made to www.wellmanfuneralhomes.com.